Redstripe Ribbon Snake Thamnophis proximus rubrilineatus (Rossman, 1963) in the wild and in captivity. The name Ribbon Snake is the common name for two species of garter snake that are both slender build and very elegant: Thamnophis proximus and T.sauritus. 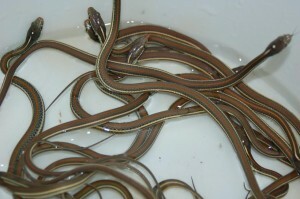 The most commonly kept ribbon snake is probably T. sauritus sackenii because it is regularly imported in large numbers. Subspecies of T. proximus are less common in private collections. 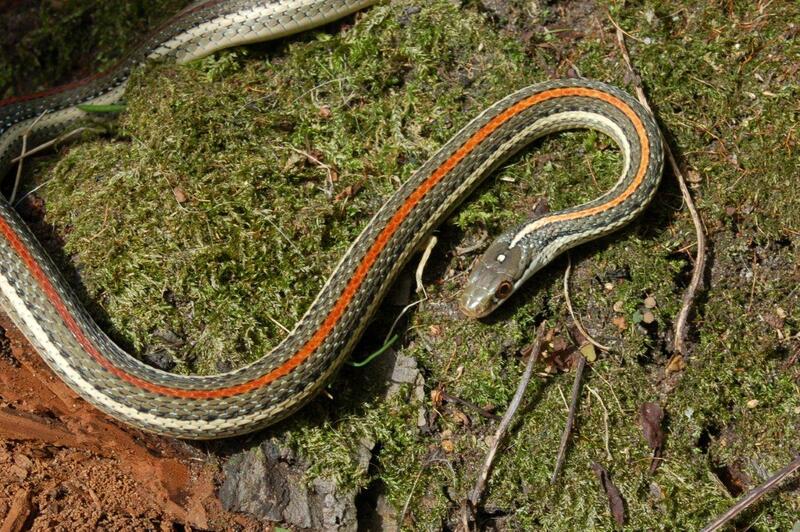 Thamnophis proximus rubrilineatus, the Redstripe Ribbon Snake is with its striking red middorsal stripe a highly attractive and still rarely kept and bred subspecies of T.proximus. In this article I want to describe my experiences with keeping and breeding the astonishing Redstripe Ribbon Snake. 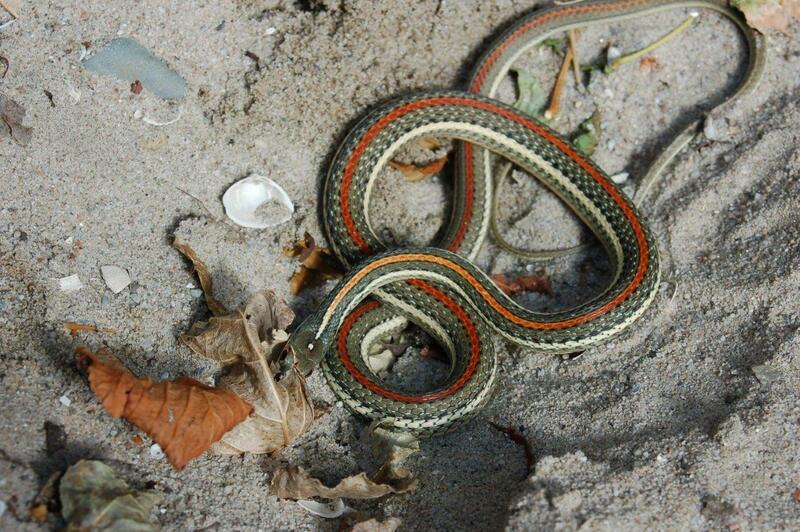 In order to have a better understanding how the Redstripe Ribbon Snake lives in the wild I have visited the natural habitat of this snake a few times and I will share some of my observations in this article. The Redstripe Ribbon Snake does very well in captivity and is suitable for both the beginning and the more experienced hobbyist. With this article I want to share my enthusiasm for this beautiful and unique species of garter snake. This article can serve as a guideline how to keep and breed this species with success in captivity. Thamnophis proximus is a relatively long species of garter snake. The maximum length that is reported is 90 cm SVL (part of tail is missing; Rossman, Ford & Siegel, 1996). With an average tail length ranging from 25-33% the snake would measure 120-134 cm. Average total length however is smaller; adult snakes range normally from 60-90 cm. Males remain small and slender, but older females can become very long and relatively stout bodied. It is easily distinguished from the other subspecies of T. proximus because of its bright red middorsal stripe. On the internet I have also seen a picture of T.p.diabolicus with a bright red middorsal stripe, but unfortunately internet is not always a reliable source of information. In literature (Rossman, Ford & Siegel, 1996) I have not found any data confirming red middorsal striping of any of the subspecies of T. proximus nor T.sauritus. The belly is normally unpatterned with a golden colour. 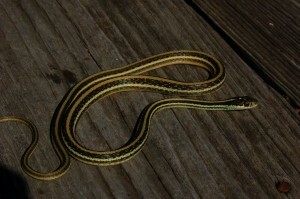 Lateral stripes vary from white to yellow, and the dorsal colour can be grey, brownish or greenish. The snakes can have some spots in between the dorsal stripes, but usually the pattern is quite inconspicuous. Thamnophis proximus rubrilineatus is endemic for Texas (which means it only occurs in the state of Texas) and its distribution is confined to the Edwards Plateau. 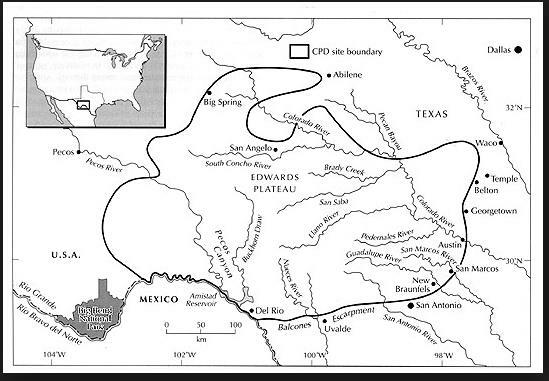 Rossman, Ford & Siegel (1996) give the following description of the habitat of T. proximus: strongly associated with brushy habitats in close conjunction with aquatic situations (swamps, marshes, ponds, lakes, rivers, creeks and desert springs). T.proximus occurs form the great lakes all the way down to Costa Rica and currently 6 subspecies have been described. Elevational distribution is from 0-2438 m. See Rossman, Ford & Siegel (1996) for more details. As a minimum requirement for the size of the terrarium to keep 1 or 2 adult couples of this species I recommend 80 x 50 x 50 cm (LxWxH). I have kept these snakes in both all-glass as wooden (with a glass front) terrarium. Personally I prefer the wooden terrarium since the snakes tend to be very fast and they might hurt their snouts against the glass when it is all glass. For the proper care of this species some things need extra attention. The terrarium must be well ventilated, the land part must be completely dry and the right temperature range must be created. For ventilation I use generous strips of wire mesh in the lid (asymmetrical) with a minimum of 20% of the surface. Although the snakes are highly aquatic they should certainly not be kept in a damp and moist environment. Keeping the snakes in a too damp cage can easily cause skin problems. This species will probably thrive in a natural habitat (aqua) terrarium with a large water bowl in which one offer can live fish. But personally I have kept them always in a dry terrarium with merely a water dish. In this case the water bowl consists of less than 1/6 of the bottom surface. The bottom surface is usually filled with beech woodchips. As stated above it is crucial the land part of the terrarium must be kept completely dry. Spraying water to mimic rainfall will certainly be no problem, although I rarely do so. The water part consists of an bowl made of rock or plastic, so that the land and water area is completely separated. In order to make the interior of the terrarium more attractive and natural I use stumps, branches to climb, boulders etc. I give the snakes always the possibility to hide themselves. In a corner of the terrarium I put some leaf litter or pruned conifers branches from the garden for an extra natural effect and hiding place. Plants I do not use (anymore). The terrarium gets completely cleaned and disinfected at least 2 – 3 times per year. For heating and illuminating the terrarium I use a light bulb (normal one or a reflector) of 15 – 75 Watt depending on the snake room temperature. The bulb is placed in a corner of the terrarium and some branches allow the snakes to bask right under the bulb. I always try to create a temperature range with a warm corner of at least 30 – 35°C and a cool corner not warmer than 20 – 24°C during daytime. The combination of ample ventilation (asymmetrical), sufficient terrarium volume (not too small or too low) and a light bulb high in the least ventilated corner of the terrarium automatically creates a temperature range! Noteworthy is the fact that all of my terrariums are placed in a not-heated attic room. In the winter months the temperature in this room fluctuates from 5 – 12°C during night time and to 10 – 15°C during daytime. When outside temperatures rise the snake room temperatures rise as well. During summertime temperatures can rise up to at least 30°C and higher. A thermostat that shuts down the bulbs (the heating inside the terrariums) as soon as the room temperature rises above a particular threshold. As threshold I mostly use 24 – 26°C, in order to prevent that the temperature in the terrarium rises too far. Except during the hibernation period (see hibernation) the bulbs are switched on from 8 AM until 9 PM with little variation of the “day length” during the season. At nights all lights (heating) are shut off which causes the terrarium temperature to drop to the snake room temperature: 10 – 12°C in the early spring (February / March / April) to 18 – 25°C during the warmer months of the year. Preferred body temperatures of most garter snakes are estimated somewhere between 26 – 32°C (Rossman, Ford & Siegel, 1996), and a temperature range allows snakes to regulate their own body temperature just like in the wild. Observing the behaviour of the snakes also can gives you indications whether you have created the right temperature range: when T.proximus rubrilineatus does not bask on the warm spot and hides itself during the whole day then the temperature is most likely too cold (and they sort of expand the hibernation period in the heated terrarium) or too hot (so they look for the coolest place in the terrarium which is most likely in the coolest corner under rocks or debris). The ideal behaviour I like to observe is that within 1 – 2 hours after the bulbs are switched on the snakes will start basking on the warm spot and later during the day they will continue basking a little further away from the hot spot or even totally hide themselves. This observation combined with regular feeding behaviour of the snakes and a cool spot which is not warmer the n 25 – 28°C maximum (colder is not problem) gives me the conviction that I have created the right temperature range. 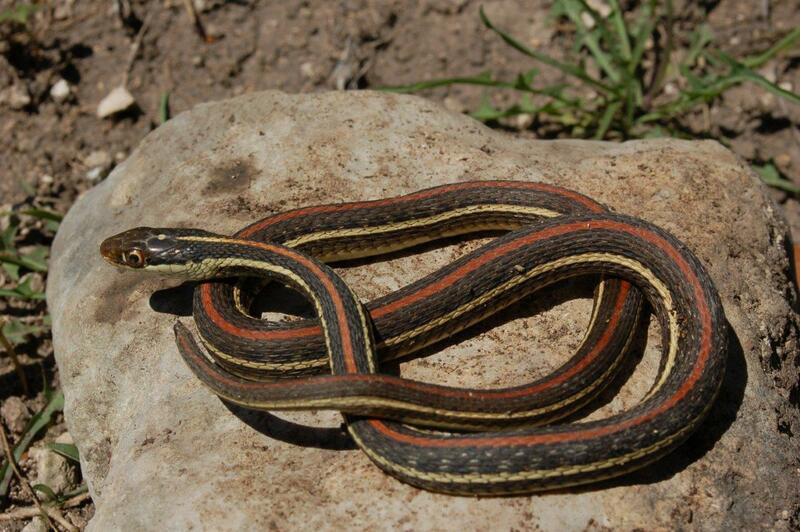 The Redstripe Ribbon Snake is endemic to the Edwards Plateau. 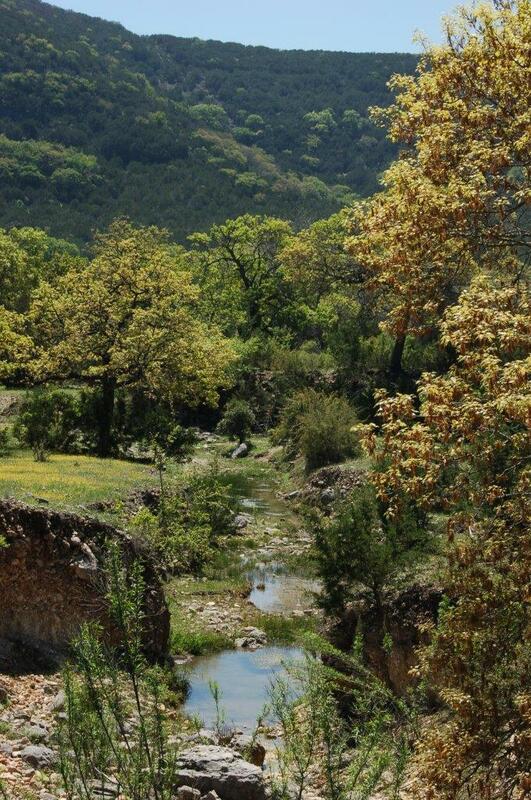 It is a beautiful area with gentle hills, limestone rocks, small canyons and a lot of creeks with clear water. 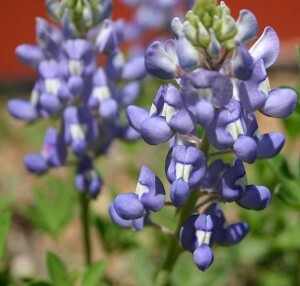 Early spring lots of wild flowers are flowering, like the famous Texas Bluebonnet. End of April 2000 and early April 2001 I spent 5 days in total on the Edward Plateau looking for snakes (Bol, 2001). End of March 2012 I have visited the area for the 3rd time. 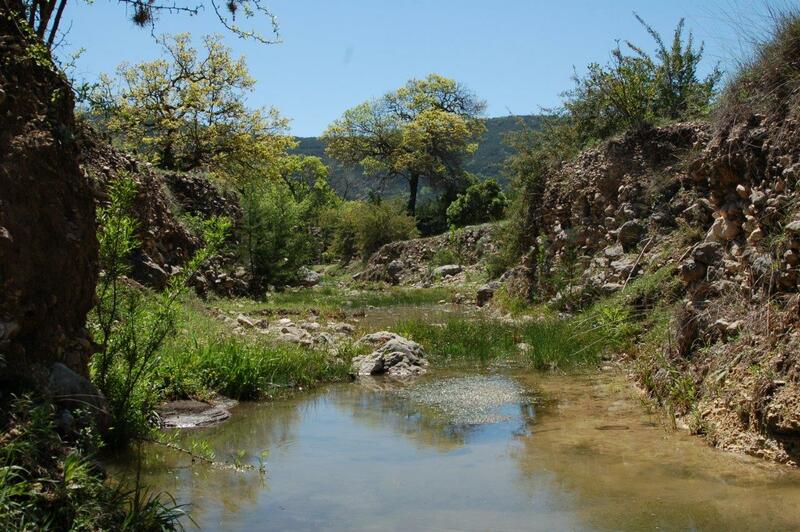 One of the habitats where I observed T.p.rubrilineatus was a little creek in Real County (altitude approximately 490 meters) that belongs to the Rio Frio drainage system. During all my visits in March and April the creek was dry except some spring fed pools. Over a length of 1 km of creek approximately 120 meters had small pools. I suspect that in the rainy season in the summer the creek does contain water. The small pools had a muddy bottom and had lots of small fish, large tadpoles (of previous year) and adult/semi adult frogs (Rana berlandieri). Two species of fish inhabited the pools, a guppy and a soil dwelling species. One of the pools was the home to a large water turtle. Some pools were shaded by trees, but most were sun exposed. The general area is gentle rolling hills, grassy with some small trees and shrubs. Cows roam free and keep the vegetation short. I would not describe this as brushy habitat, although most pools had some brushy growth nearby. On April 22nd I searched from 3.30-4.30 PM. The first Redstripe Ribbon Snake I saw was hunting in a small and very shallow pool of 2×1 meter. It was making wide circles underwater. It was a little female of 46,5 cm TL (38,5 cm SVL). When she stuck her head above the water to rest and breath she saw me and she tried to get away. She was very skinny and had many wounds/scars on its body. She showed no signs of food in her stomach. She almost looked like she just came out of hibernation, but that is of course merely a guess. Some minutes later I found a small specimen hiding under a small rock close to the same little pool. It was a female with a total length of 29,5 cm (25,5 cm SVL). Also very skinny, heavily damaged and she missed the biggest part of her tail. She produced dark faeces so she must have been feeding. This specimen was probably a young born the previous summer. On April 24th I searched from 11.30-11.50 AM. No activity. At 3 PM I checked the pools again and I saw a snake swim from one side to the other in a shaded part of the creek that had flowing water. This part of the creek only had small fish and when I captured the snake it regurgitated a small fish. Again a female; total length was 50,5 cm (43 cm SVL, part of tail missing). As with the previous 2 snakes she had scars and she lost a part of the tail, but she definitely looked less skinny. I would even call her well-nourished and possibly pregnant (early stages). It is amazing how fast Redstripe Ribbon Snakes are in the wild (once heated up) and how difficult they are to catch even in the most open habitats where they do not have many options to escape. Obviously they rely on eyesight and speed a lot, but judging on the amount of scarring the predation pressure must be high. All three Redstripe Ribbon Snakes looked quite similar as far as coloration and pattern is concerned. 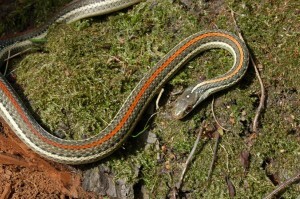 The middorsal stripe is best described as “warm brown red”. 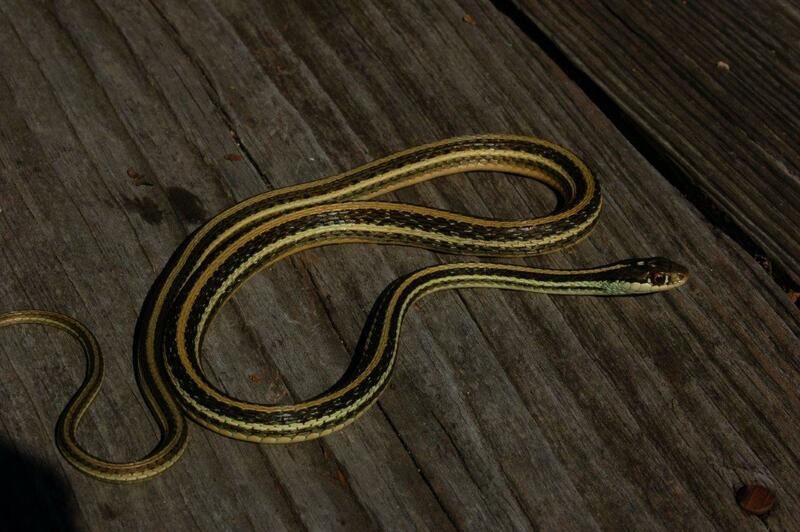 The lateral stripes where yellowish and the color in between the stripes was olive green. They had some small spots between the stripes and interstitial skin was dark with white spots (although this was barely visible due to the fact that the snakes were quite skinny). The following year I visited the very same habitat again on April 7th and 8th. The first day it was raining mildly. Temperature was 19⁰C when I checked the habitat between 1 – 1.30 PM. Fish, frogs and tadpoles were present but no snakes were seen. The following day I checked again around 12.30 PM. After a rainy morning the sun started to shine and temperatures rose to 27⁰C. No reptilian activity other than a lizard (Cnemidophorus sp.). Twelve years later I visited the same habitat once more on March 25th 2012; the day started cloudy and cool, approximately 19⁰C. I arrived just after noon, the clouds were gone and temperatures had risen to approximately 25⁰C. Near one of the larger shallow pools with a surface of 8 m² a young adult female T.proximus rubrilineatus was basking on the shaded shores and fled into the water. She had a total length of appr. 50 cm. Part of her tails was missing and she had recently eaten. About 2 hours were spent that day checking the pools and parts of the creek that were completely dry. No other snakes were found. So the snakes apparently survived over the years in this habitat, although numbers are low. Due to the limited amount of water in the pools and hence the limited amount of prey items the habitat could probably not “feed” large numbers of Ribbon Snakes. 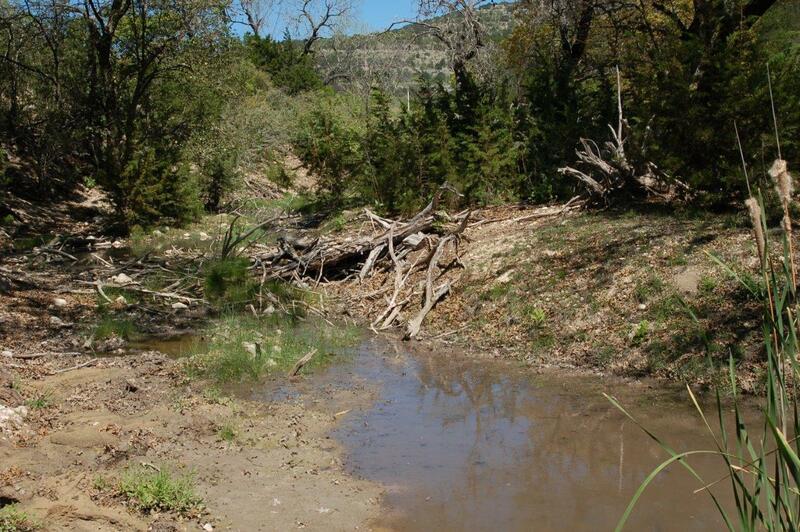 A second habitat I visited is a larger running creek flowing into the Frio River (Real County). 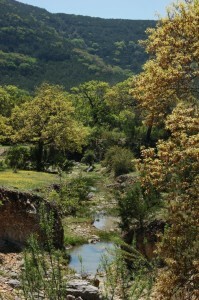 This creek is 2 – 10 meters wide and up to 1 meter deep. On April 24th 2000 I visited this habitat and checked both in the morning (9.15 – 10 AM) and in the afternoon from 12 – 2 PM. It was hot and sunny. The creek was “loaded” with fish and also several amphibians (Cricket frogs and Leopard frogs) were seen. The creek was bordered by bushy growth and seemed like ideal habitat for the Redstripe Ribbon Snake. I found a 75 cm long recently shed skin floating on a mass of water plants which belonged to a Redstripe Ribbon Snake (based on pattern and position lateral stripe on scale 3 and 4). A 3rd habitat I visited was larger creek that was flowing relatively fast. This creek, situated in San Saba County (335 meter high), was about 15 meters wide and up to 1 – 2 meter deep. Weather was very nice on April 23rd 2000 when I visited this habitat; clear blue skies and up to 30⁰C. Fish is abundant. On the rocky shores were the water was shallow Crickets Frogs were very abundant. I searched from 11.15 AM to 2 PM. Around 12.30 PM I saw 2 smaller specimens that were apparently hunting in the water near the shore quickly swim away underwater. They were too fast so I do not know their exact sizes, but my guess was appr. 30 cm total length. At 12.45 PM I saw a larger Ribbon Snake swim in the water. This time I was lucky: she had a total length of 53,7 cm (40,2 cm svl). She had no scars and her tail was almost complete. She had not fed recently and was very skinny, unlike the other larger female I found in the other habitat. Certainly no early pregnancy. 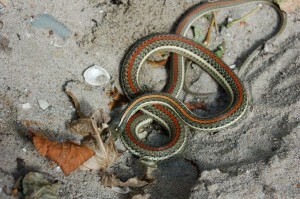 The middorsal stripe was darker red than the snakes from the other location. The lateral stripe was pale, almost white. The scales between the stripes were darker, not green. The Redstripe Ribbon Snake shares this habitat with Nerodia erythrogaster transversa, the Blotched Water Snake. I saw 1 juvenile and one adult male (95 cm TL) swimming in the creek. The Redstripe Ribbon Snake seems to be highly aquatic, always found in the water or very close to the water. Several other aquatic habitats on the Edwards Plateau were visited during these trips that all looked very suitable for Ribbon Snakes, smaller and larger creeks and ponds with lots of fish and frogs. No Redstripe Ribbon snakes were found in these habitats. These observations are in contrast with observations I made October 23rd 2013 in a swampy area south of New Orleans in the Mississippi delta. 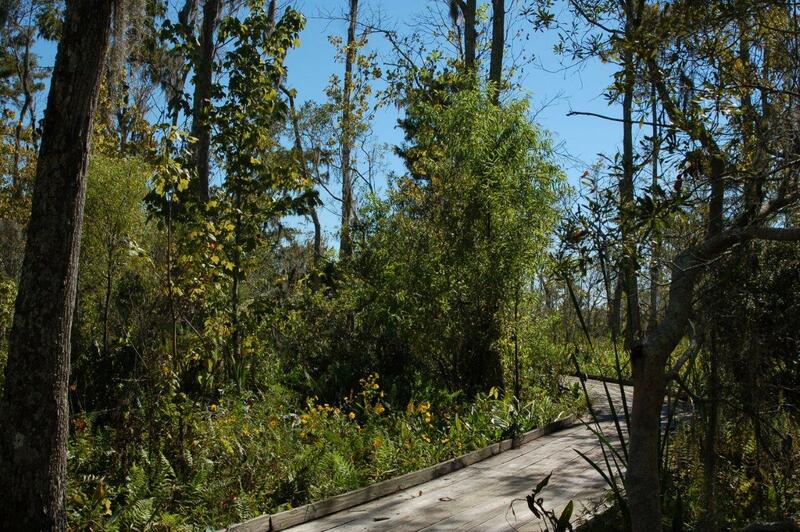 A board walk through a swamp best described as a Flooded Forest with many cypress trees was an “El Dorado” for Thamnophis proximus. The subspecies living here was T.p.orarius and between 10.30 AM and 12.30 PM I discovered approximately 20 adults (all appr. 60 – 70 cm in total length) basking along the boardwalk in the sun. Many contained food items (no doubt these were frogs), although I would call them all skinny compared with my captive T.proximus. Some were actively hunting through the brush, examining the undersides of the leaves for tree frogs. Their slender bodies made it possible to follow the stems of thin twigs and plants without breaking them and scaring the frogs away. They shared this habitat with other highly aquatic species like Nerodia fasciata pictiventris. 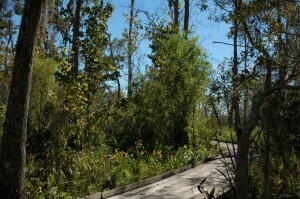 When I walked the same boardwalk back around 13.30 PM no more snakes were seen. It was probably hot enough so they needed to expose themselves in the sun basking anymore. This also shows that for snake observations in the wild you need to be at the right time at the right place. 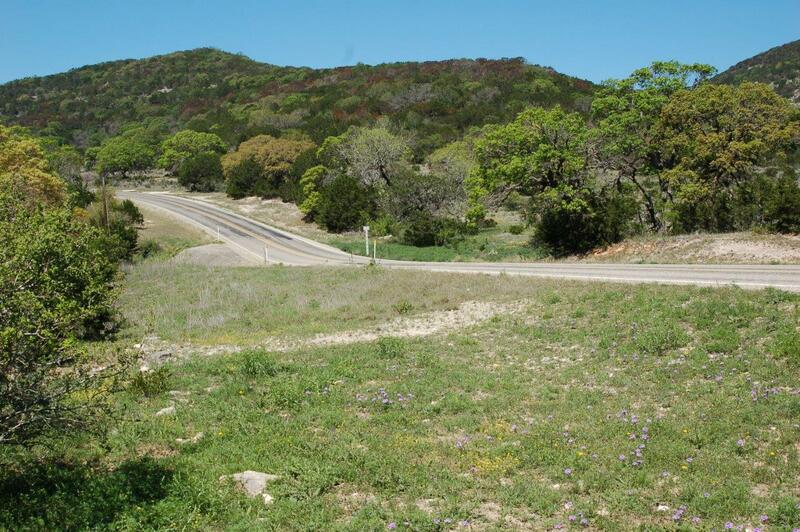 Fietz (2013) describes his observation in June 2012 on the Edwards Plateau where he observed 7 T.p.rubrilineatus, all close to the water’s edge. He also saw some large adult females of 80 – 100 cm. So although my observations on the Edwards Plateau are limited to early spring it seems that T.p.rubrilineatus is certainly not very abundant or occurring in high numbers. This is confirming verbal communications of American herpetologist who have expressed that T.p.rubrilineatus is becoming quite rare on the Edwards plateau. 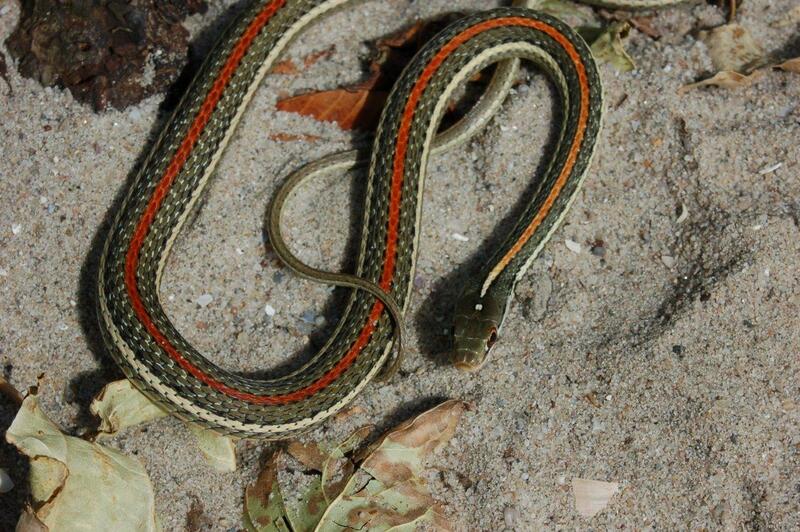 The observations of Fietz (2013) suggests that the Redstripe Ribbon Snake occurs in good numbers. Other habitats like the above mentioned southern Louisiana swamp definitely contain very high population densities of T.proximus. 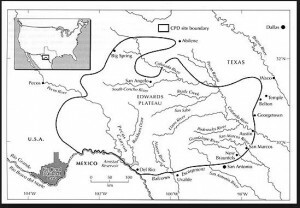 Climate of the Edwards Plateau. Temperatures can be very high in this part of Texas, with July and August being the hottest month on average. Rainfall occurs throughout the year, although June is on average the wettest month. Average daily high temperatures vary between 25 – 33⁰C from April throughout October. It is noteworthy that records high temperatures of 30⁰C have been recorded even in the winter months, but on average December throughout February are cool with average high temperatures of appr. 16⁰C. Night temperatures are on average 0 – 9⁰C in the winter months, but freezing night temperatures can occur from October to April with extremes as low as -15⁰C. Combining the climate data with my personal observations and my observations in my terraria and in the wild over the years I expect that T.p.rubrilineatus hibernates from November-April and that the snakes I observed in March and April just had become active. It might be very possible though that during hot spells of a few days in winter the snakes do come to the surface to bask. Rossman, Ford & Siegel, 1996 state that hibernation in southern (coastal) populations of T.proximus appears to be an intermittent phenomenon. The snakes are sometimes active in the winter months and they were even seen with prey in their stomach during hot spells of several days in December and January. This probably does not apply for T.p.rubrilineatus. I hibernate my Redstripe Ribbon Snakes for approximately 3 – 4 months (12 – 16 weeks) starting early November or December. I do this for the following reasons: keeping the snakes in a way that closely resembles the natural situation and breeding them according a planned method. For more details about my method hibernation please read Bol (2004). Minimal 2 – 3 weeks before the start of the hibernation (early November) the snakes are offered food for the last time but I keep the terrarium well heated so that it no undigested food remnants stay behind in the intestine channel. After those 2 – 3 weeks in the heated terrarium without food I switch off the lamps/heating. The animals remain then in the unheated snakes room by temperatures that in this time roughly fluctuate between 12 – 18°C. After a (sometimes very) short period in the unheated terrarium (at most four weeks, mostly shorter), I place the snakes in a hibernation box. I use for this plastic containers (content approximately 6 liter) with limited ventilation capacity created by some holes in the lid. This is essential, since garter snakes are prone to dehydration during the hibernation (especially in the fridge). The containers are filled for two third with a mixture of sawdust and damp leaf (normally from the garden, no need for disinfection), and I make sure the substrate is slightly humid by sprinkling water over it. As long as the insides of the lid contains some water droplets due to condensation I consider the substrate to be damp enough, otherwise I sprinkle some extra water. In this way the snakes hibernate, without water tanks, in the containers outside in a shed. Temperatures during hibernation range from 0,5 – 8⁰C. I check approximately once per month to see if the snakes are OK. Often the Redstripe Ribbon Snakes crawl away in the substrate. After opening the box the snakes react by tasting the air with their tongues or possibly slowly crawling around. My experience is that as long as the substrate is damp enough the snakes survive this hibernation period of 3 – 4 months easily, hardly lose any weight and they still are in perfect shape after the hibernation period. I have never seen any problems with a substrate which was too damp. Over the past ten year that I have hibernated this species in this way not a single one died. Also young snakes, which usually are a few months old in November, are hibernated in the same way as the adult animals (in the wild these young snakes also do not receive a special treatment). The only difference is that the duration is shorter: on average 6 weeks. Spring starts early in captivity as soon as the snakes are placed back in the heated terrarium. A transitions period is normally not created and from the first day onwards I try to create a warm spot locally of 30 – 35°C. Usually the snakes react by sunning themselves almost the whole day directly underneath the lamp. In the nature these transitions also do not occur gradually. ROSSMAN, FORD & SIEGEL (1996) give an excellent example of the daily fluctuations in the body temperature of a Thamnophis elegans in California in April. During a cold night the snake has a body temperature of 8°C (from 6 o’clock in the evening until 9 o’clock in the morning), after which it rises rapidly, under the influence of the powerful sun, to a maximum of 25°C around 12 o’clock at noon. Around 3 o’clock in the afternoon the body temperature is still 20°C after which it drops gradually to 8°C. Mating behavior is regularly seen in the first weeks after hibernation. This normally starts already before the snakes shed their skins for the 1st time after hibernation. Mating behavior is quite similar to other Thamnophis species: the male crawls on top of the female and attempts to curl his tail underneath and around the tail of the female. Heavy shocks run through the body of the male. I do not separate the sexes during the year; males and females live year-round in the same cage. Keeping the snakes separate in order to stimulate mating behavior is absolutely not necessary in my opinion. The only disadvantage of keeping the snakes together is that it diminishes the chance of witnessing a real mating. Within 1 – 2 weeks after hibernation the Redstripe Ribbon Snake can start to feed in captivity. When the terrarium is (too) cool however the snakes may refuse to eat for several weeks and “continue” their hibernation in the terrarium. Using a bulb with a higher wattage often solves this issue. Thamnophis proximus rubrilineatus is offered a diet of exclusively fish. Currently mainly Smelt (Osmerus eperlanus), in the past also other fish like Barbus spp. and other (mostly freshwater) fish species. T.p.rubrilineatus can be switched to a diet of mice (pinkies) although they are less inclined to accept mice then other garter snake species. I prefer feeding them fish. Ribbon Snakes are in the wild specialized on amphibians and fish; Rossman, Ford & Siegel (1996) mention a rare occasion where 2 specimens of T.proximus are found with skinks in their stomachs. Mice have never been reported as food items. The snakes are fed every five to seven days and they can eat as much as they want. The (thawed) fish are offered on a small plate in the terrarium mostly in the evening. I remove the fish the following day. To prevent a deficiency of Thiamine (Vitamin B1; see Zwart 1982) I add several droplets of vitamin B1 every time if feed them. Multivitamins (mostly Nekton Rep) I add only once every 1-2 month. Since the snakes are fed with whole fish including bones, intestines and scales adding calcium is absolutely unnecessary and I have never done it. Life fish are hardly given, but that is more because of practical reasons. Sometimes I give the young snakes life fish to stimulate them to start feeding. They respond very well to it. Mating can usually starts in the weeks after the hibernation has ended. I have observed most of the mating behaviour 2 – 4 weeks after the hibernation has ended. The females are quite voracious after hibernation and mating and usually 2 – 2,5 month after the hibernation becomes clear that the females are pregnant. The females become quit thick and the skin between the scales remains visible even when the snakes have not eaten for 4 – 5 days. The babies are born in captivity about 4 – 5 months after the hibernation has ended, mostly in July and August. But this of course depends (amongst others) on when the hibernation period is ended. In table 1 I give some data of 5 litters of 5 different females. The number of babies can vary greatly. Young females can give small litters (the smallest litter I had which is not in this table is 2 babies of a 60 cm TL female) but well fed and large females can give large litters. A more thorough analysis of all my data gathered over the years will hopefully follow later. The largest litter in table 1 is 26 babies. The average clutch size is 12,4. Average total length (TL) of the babies varied from 20,7 cm to 23,2 cm. The largest baby was 24,8 cm. Average snouth-vent length (SVL) varied from 15 – 16,7 cm which falls in the range mentioned by Rossman, Siegel & Ford (1996):13,0 – 17,4 cm svl. Over the years I had a few occasions where a female had 2 clutches per year. This option was also suggested in Rossman, Siegel & Ford (1996) for wild T.proximus, but this never has been confirmed in the wild. 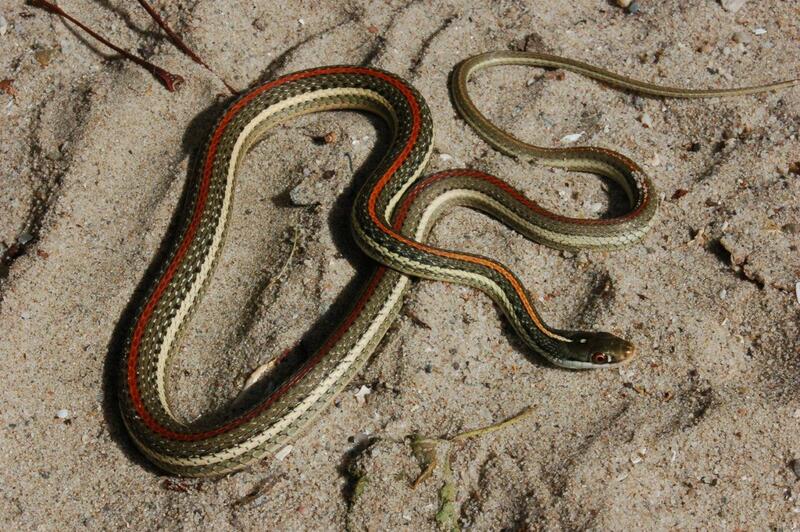 Normally however the Redstripe Ribbon Snake reproduces only 1 time a year. After birth the young are separated from their parents and placed in smaller terrariums (52 x 35 x 30 cm or 32 x 27 x 30 cm) in groups of ideally not more then 10 snakes. Usually the young shed their skins directly after birth just like all other garter snakes, unlike the European Natricinae like the Viperine watersnake (Natrix maura) where this event takes place 7 – 10 days after birth. In case the baby garter snakes have difficulties shedding their skins it is advised to place the snakes in a very moist container for a few hours. Then either try carefully to help the snakes with shedding their skin or place the snakes in their terrarium with sufficient rough surfaces likes rocks or pieces of wood so they can do it themselves. But usually this is not necessary and a sign of a lower fitness. As far as temperature and decoration are concerned the terrarium for the young is identical to the one for the parents (see chapter “the terrarium”). Normally I offer the babies food for the 1st time after a few days to a week. The diet consists of fish, just like the parents. Ideally the size of the fish is chosen so that the widest part of the fish is slightly wider then the head of the baby snakes (so they can eat it just barely at once). Other wise I cut the fish in small pieces (including scales, intestine and bones). They are offered more food then they can eat within 12 hours, and normally the following day or morning the left over’s are removed. Food is offered every 3 – 7 days. To get the babies started it is sometimes necessary to offer them a few times life fish in a small water bowl. T.p.rubrilineatus can grow quite fast, even when fed only once every 3 – 7 days. When fed they are extremely thin, but it is extraordinary how fast they gain body mass and get thicker after just a few meals. Some babies born in 2007 (3.5) were measured after 4 months of growing just prior to hibernation. The 5 females measured 39,1 cm on average, the 3 males measured 39,5 cm TL. SVL of these babies were 28.6 cm for thee females and 28,8 cm for the males. Rossman, Siegel & Ford (1996) mention that T.proximus (Clark, 1974) might reach sexual maturity 12-15 month after birth and could mate for the first time in their second spring. This will probably be based on observations of coastal populations like in Louisiana where hibernation is very short or non existent. Rossman, Siegel & Ford (1996) recorded as the smallest size for sexual maturity in females (from Texas and Louisiana) 48.5 – 51,5 cm snout-vent length. The smallest gravid female I have seen was 43 cm. I usually keep my snakes together year round so they can mate when they are ready. I have seen males become sexually active in their second spring. My captive bred females (N=3) have never given birth before they were 5 – 6 years old. I have had several specimens that have reached the age of 11 – 13 years. By that time females have reached a total length of approximately 1 meter and they can easily way 150 grams. Males do not get much bigger then appr. 70 cm and way usually not more then 60 grams. Thamnophis proximus rubrilineatus is a very attractive species. They are more slender built then other species of garter snakes and because of that they are more suitable for a terrarium with plants in which they can climb. They do very well in captivity and can be kept in a (partly) dry terrarium without many difficulties. A hibernation is strongly recommended, especially when one wants to breed this beautiful species. 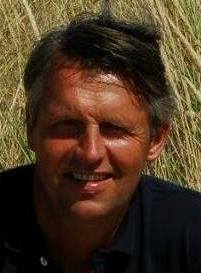 Fietz, L., 2013. Reisebericht 2012-Von der Bullennatter zur T.p.rubrilineatus. The garter snake 18 (2): 15-20.